Experience the sights and sounds with river views to awaken the senses on your Danube River cruise from Germany to Hungary. Begin your European vacation your way with two nights in Munich before your cruise. You’ll enjoy a full-day guided tour to Neuschwanstein Castle-home of King Ludwig, and plenty of free time to explore the Munich before your cruise. Board your Suite Ship® in the "City of Three Rivers" in Passau, Austria, and sail to the lovely city of Linz for guided sightseeing, including Austria’s largest medieval square and the towering marble Trinity Column. 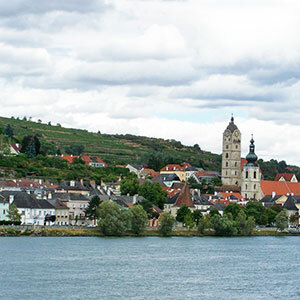 Sail through the picturesque Wachau Valley to Krems and explore the small village-seemingly untouched by the modern world. You may choose to enjoy a wine tasting with a Wine World Experience to discover the secrets of winemaking and its history. Next, sail to Vienna-the City of Music. You’ll marvel at the sights with a guided city tour of Vienna’s gilded landmarks-including the Imperial Palace, the world-famous opera house, and stunning St. Stephen’s Cathedral. Visit Bratislava, Slovakia, on your Danube River cruise to explore the quaint streets of Old Town and St. Martin’s Cathedral. You may decide to join your Avalon Adventure Host on a hike to the castle above! Continue your European vacation your way with two nights in Budapest after your cruise. Explore the "Pearl of the Danube"-Hungary’s captivating capital city.